Understanding the ESSO gas card can be intimidating and overwhelming for newcomers or those due to PCS to Spangdahlem. 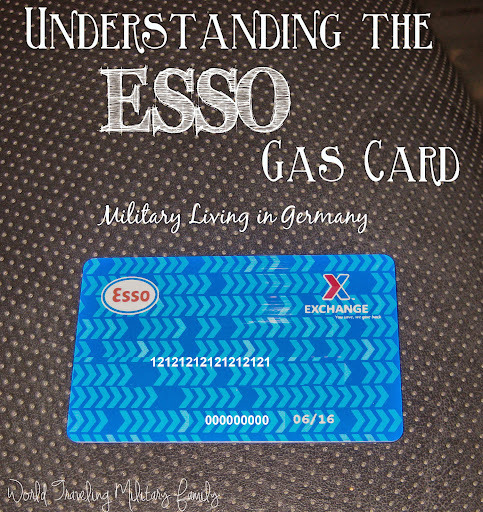 For those of you who don’t know what an ESSO gas card is living in Germany as a military family requires you to use an ESSO gas card, so that you do not have to pay German economy prices. Before we arrived I worried about not having enough gas rations each month and having to pay outrageous economy prices. Now that we are here I have found that it is really not that intimating once you get all the information, so hopefully this post will be reassuring to those who may be headed this way. I also recommend you check out the Exchange’s Germany Fuel Ration Program which has some very helpful info, including a 19 page downloadable PDF file listing all ESSO stations here in Germany! To get your ESSO card here at Spangdahlem you go to the Shoppette, to the last checkout counter. You’ll need your vehicle registration and ID. They give you a green folder with your ESSO card. You get 1 Esso card per vehicle, unless there are more that 2 licensed drivers using it, then you can be issued an additional card. We have 2 vehicles so we have a card for both and my hubby & I. Our teenage son was driving as well so we could have gotten him one but we never got around it it. We just made sure Mr. B or I took the vehicles to get gas and now he’s at college so it’s not a big issue. Had he been driving here for longer than 6 months we would’ve gotten him a card. These cards are important because if you do NOT have your ESSO card you have to pay outrageous German fuel prices. It normally costs us a little over $60 to fill up the Yeti (aka mini van) on base. On our trip to Paris we had to fill up on the economy and it cost us $120 for 3/4 of a tank, so you can see there is a big price difference! While Germany sells gas by the liter, I looked up the equivalent and currently a gallon of gas on the German economy is around $7.69, compared to the $3.70 we can get it for on base. There is also a ration on how many gallons you can get per vehicle per month. For instance for our car we get 400 liters a month and for our van get 600 liters a month. Each time you get gas on the bottom of the receipt will be how many liters you have left for the month. When we first got here I felt like we were checking the liters left like crazy, now that we’ve been here awhile and I know we always stay under I rarely worry about it. You can put money on the card to ‘pre-pay’ to use it at ESSO stations off base, you can do this at the Shopette or online as well. 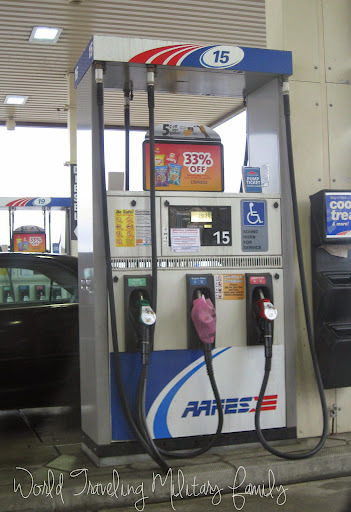 It can be used at any base gas station in Germany or an ESSO station in Germany as well. You will need to set a PIN for the off-base purchases so it’s important to remember that number. Please note that the ESSO card is good ONLY in Germany. To find ESSO stations in Germany you can use a free app called Esso Fuel Finder for iPhones. If you drive outside of Germany you’ll be paying economy prices for gas. Make sure you have your ESSO card, if not you’ll have to pay the economy price, yes even on base! Choose gas pump & fuel, put fuel into your vehicle. 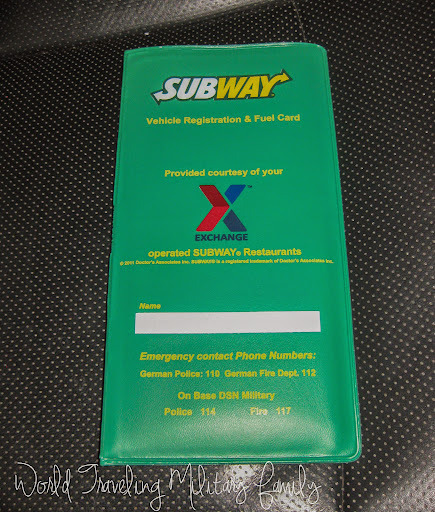 Take your green folder with your registration and ESSO card in it, as well as your ID. Make sure you know what pump number your on and go pay inside. When you get your receipt on the bottom it will say how many liters you have remaining for the month. When we arrived I was having to drive back & forth to Bitburg 1-2 times a day from Spangdahlem & the Speicher area, I never not gotten close to going over my liters for the month. This is also with using the van for day trips and away basketball games so we have not had any issues with the determined amounts of gas, which is something I was concerned about before we moved here. We have been here 10 months and we have never gone over our rations and that includes taking trips to Wiesbaden, Paris, etc where we stayed several nights. So unless you drive a gas guzzler or drive extreme amounts each month you should be fine. Do you have any advice for using an Esso gas card? Great summary, thanks! I do have a word of caution about the PDF on the AAFES site…I don’t see a date on it, but it is not entirely current. It lists an Esso in Pruem which is NOT there (learned that the hard way!). We check the Esso website (http://www.essofuelfinder.co.uk/) before we go on an out-of-country trip to find the last Esso in Germany before crossing a border and fill up there, and mark it in our GPS in case we need to stop again on our way back. I would guess that the iPhone app is current but we’re not that high-tech. I think gas on the economy is actually closer to $8/gallon, so it’s worth it to understand the system! You can also request extra rations if you are close to going over. We’ve had to request extra when we’ve done some traveling and there hasn’t been a problem getting more rations added for the month. Good to know! Even with all of our traveling we haven’t gone over yet but I’m glad we can request more if we get close! This is great to hear! I just read this to my husband so we know how it all works once we arrive. You’re always full of such informative posts! Such a great resource! !